C.J. Henderson’s early days were spent in the Midwest. High school and college kept him in the general area of Pittsburgh, but shortly thereafter it was on to the big city, more specifically, New York City. A comics writer for the past thirty years, he has handled everyone from Archie to Batman and the Punisher to Cherry Poptart. He has also written hundreds of short stories and thousands of non-fiction pieces. Henderson lives in Brooklyn with his wife, fashion designer Grace Tin Lo, his daughter, Erica, and everyone’s cats, Tyco and Tiger. See his other work at C.J. Henderson’s website. Read Justin’s interview with C.J. Henderson. I recently chatted with C.J. 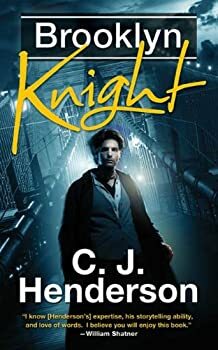 Henderson, whose book Central Park Knight, sequel to Brooklyn Knight (which was really fun!) is being released today by Tor. We'll be giving away a copy to a couple of commenters. Justin Blazier: Thanks for taking time out to answer some questions for me. Your writing ranges across several genres. You've had successes in Horror, Detective, Adventure, Comedy, Sci-Fi and Fantasy. The Brooklyn Knight series seems to provide a home for all your varied writing interests. Was that the plan? Brooklyn Knight — (2010-2013) Publisher: Professor Piers Knight is an esteemed curator at the Brooklyn Museum and is regarded by many on the staff as a revered institution of his own if not an outright curiosity. Knight’s portfolio includes lost civilizations; arcane cultures, languages, and belief; and more than a little bit of the history of magic and mysticism. What his contemporaries don’t know is that in addition to being a scholar of all things ancient he is schooled in the uses of magical artifacts, the teachings of forgotten deities, and the threats of unseen dangers. If a mysterious object surfaces, Professor Knight makes it his job to figure it out — and make sure it stays out of dangerous hands.A contemporary on an expedition in the Middle East calls Knight’s attention to a mysterious object in the collection of theBrooklyn Museum… just before it becomes the target of a sorcerous attack that leads to a siege on a local precinct house by a fire elemental.What looks like an ordinary inscribed stone may unlock an otherworldly Armageddon that certain dark powers are all too eager to bring about — and only Piers Knight stands in their way. Brooklyn Knight: A really fun story! Professor Piers Knight is the charming, handsome, and intelligent curator of the esteemed Brooklyn Museum. He has in possession the mysterious “Dream Stone” — an artifact that may hold the key to unraveling an ancient and dangerous mystery. But Knight is not the only person who is aware of its importance. With the help of his gorgeous assistant Bridget and his knowledge of magical items, Knight must protect the stone and solve the riddle in order to keep a global disaster from happening. Do you, or a loved one, like your humor squamous and tentacled? Are you the proud owner of a pair of plush Cthulhu bedroom slippers? Do all those cute Little Golden Books about religion make you wish there were a Little Golden Book of Cthulhu? 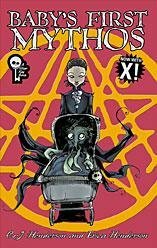 If so, Baby’s First Mythos is the book for you! Baby’s First Mythos is written in the style of children’s alphabet and counting books. You’ll learn your ABCs from Azathoth to Zarnak. Each letter stands for a character, creature, or place in the H.P. Lovecraft mythos and features a verse by C.J. Henderson and intricate black-and-white artwork by his daughter Erica Henderson. The same treatment is then given to the numbers. Teddy London — (1992-2009) Written as C.J. Henderson and Robert Morgan. Publisher: Private detective Teddy London ran the best one-man agency in New York, until a demon-driven storm trashed his office. Fate delivers a beautiful new client who is being pursued by an army of winged monsters determined to use her as the key to unlock a doorway that will lead the world into madness. London and a few souls capable of weathering the terror ahead battle for the fate of humanity-one they know they will not all survive. The Spider: Shadow of Evil — (2012) Publisher: The first new Spider novel in 65 years picks up where the last left off, packed to the gills with the greatest slam-bang action ever penned by master pulpster CJ Henderson! Richard Wentworth, the Spider, wonders if his long struggle against the forces of evil has been worth it? Should he continue, or grab for personal happiness before his time runs out? Then, at the moment he makes his decision, fate unleashes the most hellish horrors of all time against New York City! This limited edition hardcover features an exclusive, brand-new, hard-boiled Ed Race (“the Masked Marksman”) story by Rich Harvey! CLICK HERE FOR MORE BOOKS BY C.J. HENDERSON.